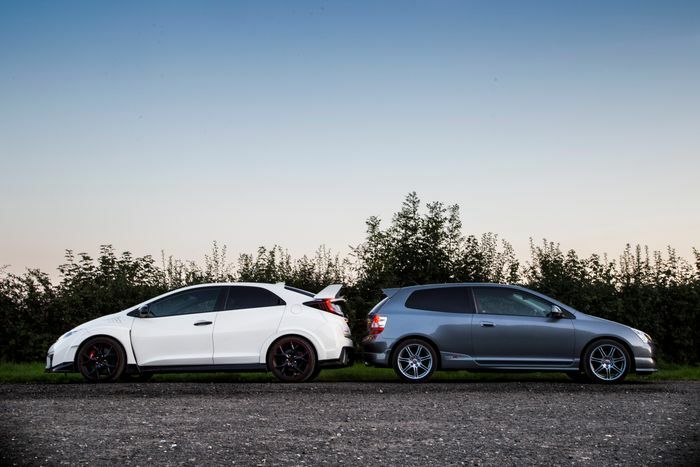 Honda Civic Type R EP3 Vs FK2: How Much Has The Game Moved On? As the car skipped over a hump mid corner - front wheels excitedly scrabbling for grip in the process - I confidently mashed my right foot into the floor, feeling the mechanical limited-slip diff put the demands of an angry turbo engine into action. The new Civic Type R’s shift light flashed red, telling me I needed to slide into the next gear using the oh-so sweet six-speed manual gearbox. Not far behind is my colleague Darren, who’s driving the old EP3 Type R. And this is no accident, because we’ve deliberately got these two cars together on the same bit of road for a very particular purpose. 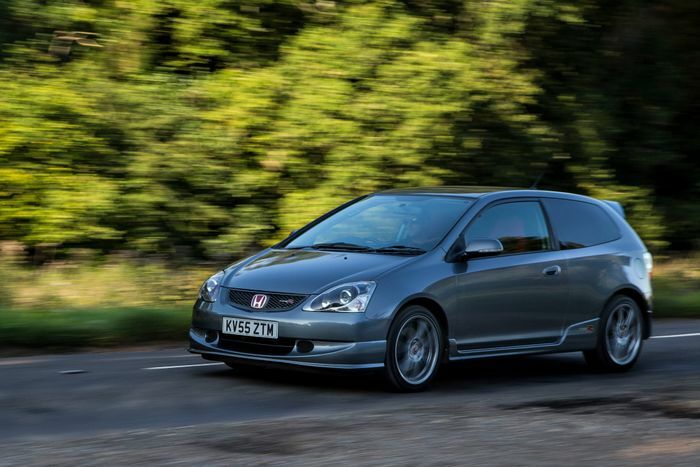 The EP3 isn’t the first Civic Type R - that’s the EK9 - nor is it the 2015 car’s direct predecessor - you need to be looking at the FN2. The first thing we noticed when getting these two together was the sheer size difference. The 2015 car is 183mm wider, 250mm longer, and 26mm taller. This is part of the reason it’s also a lot heavier: the EP3 tips the scales at just 1204kg, compared to 1382kg for the FK2. But, it’s worth bearing in mind that a bigger body gives you a hell of a lot more interior space, plus 200 litres more boot room. The EP3 feels cramped in comparison. The new car is also - as you’d expect - a lot more sophisticated. 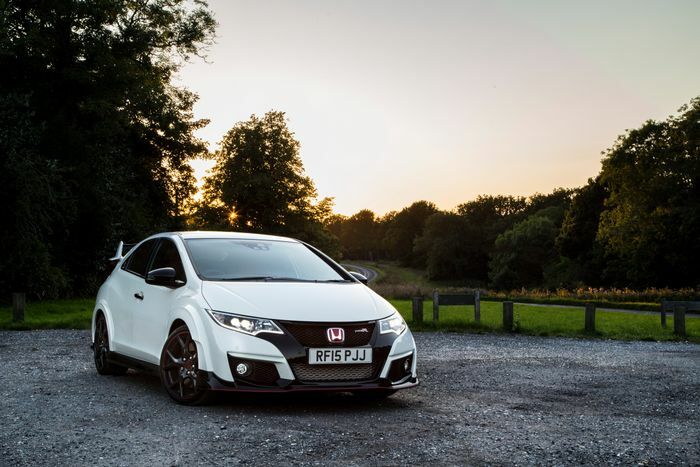 Its aero kit - consisting of a front splitter, a front bumper specifically shaped to cut turbulence around the front wheels, a flat underfloor plus a rear diffuser and socking great rear wing - makes the Civic the only car in its class to generate negative lift. In terms of straight line performance, the 2015 car also well and truly trumps the old one, despite the hefty weight disadvantage. 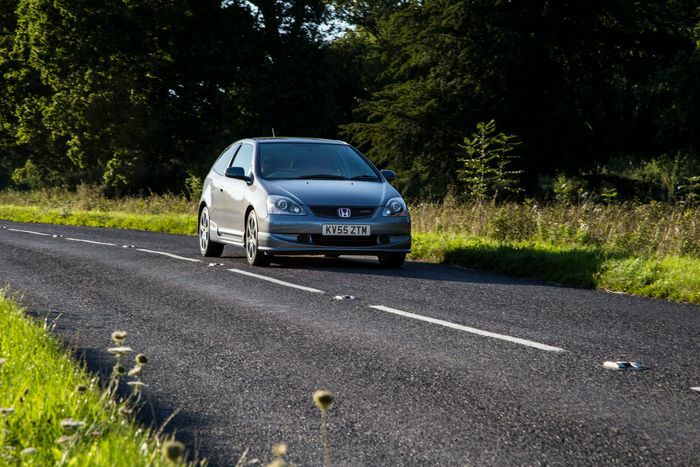 It’ll crack 0-62mph in 5.7 seconds, while the EP3 takes almost another second to do the same (6.6 seconds). Top speed is a lot higher, with the new car topping out at 167mph, compared with 146mph for the older version. The aero kit - which reduces drag as well as lift - plays a part, but it’s mostly down to a substantial increase in power. Over 100bhp more, in fact, and double the torque thanks to the shift from a naturally-aspirated 2.0-litre to a turbocharged unit of the same size. 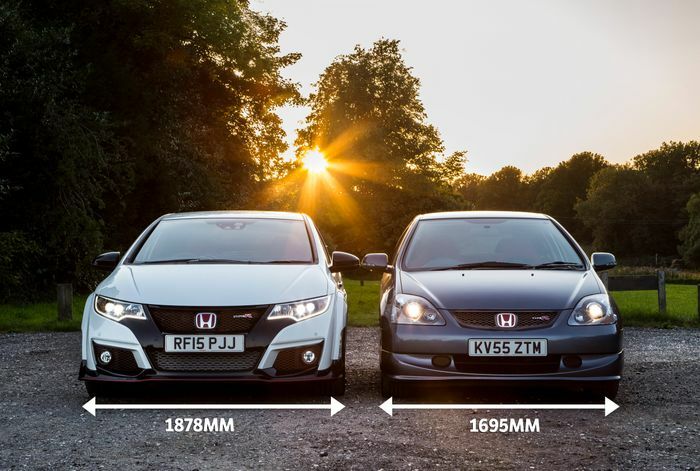 The FK2 kicks out 306bhp and 295lb ft, compared to 197bhp and 145lb ft for the older machine. And don’t forget, the FN2 produced around about the same as its predecessor, so that’s a huge bump in poke from one generation to the next. The EP3 doesn’t have a limited-slip differential, which his something the FK2 can’t really do without. As such, it has a mechanical LSD, plus a ‘dual axis strut’ suspension system which separates the steering and suspension forces in order to quell torque steer. On the subject of the suspension, the older car has an independent rear suspension set-up, while the newer one has a torsion beam arrangement. It’s made from crushed pipes rather than a solid block, upping the rigidity by 177 per cent, and negating the need for a rear anti-roll bar. All that technical stuff is nice to know, but what about how the cars feel? Happily, after extensively driving the pair on the same bits of road, we have our answer…. Holy bejesusing bloody hell, the new Civic Type R is quick. Oh sure, I’ve been in faster cars that are even more inappropriate for the road, but there’s something particularly brutal about the way the R puts out its power. Turbocharged engines these days seem to want to hide their forced induction, but not this car: the mid-range is extremely boosty, the whistling of the solitary single-scroll blower (no fancy twin-turbo or twin-scroll setups here) are clearly audible even with the windows up, and the electronically-controlled waste gate never stops chattering away. 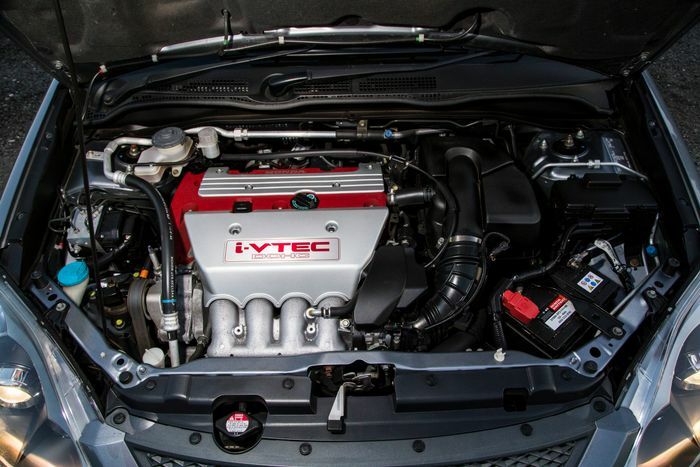 Yes, there’s still VTEC, but here it’s all about boosting the low end torque rather than making the last few thousand RPM on the clock more exciting. I can’t help but wonder what the car would be like without that, because as it is, it feels like the engine’s doing precious little before 3000rpm, before the turbo cries havoc and unleashes the boost of war. Despite all that grunt going through the front tyres, there’s a remarkable absence of extreme torque steer. Sure, there’s the odd tug or two, but it’s really remarkable how the diff and dual axis strut combo copes with the demands of 306bhp and 295lb ft of torque. The chassis continues to work amazingly well during demanding cornering. Dramatic changes in camber, tight corners, crappy road surfaces… it copes with the lot of them without so much as a shrug. Body roll is barely achievable unless you’re really trying/driving like a tool. It’s a relentless battering ram for the road that’ll stop at nothing in the quest for going mind-bendingly quickly. The damping’s well polished, too; it feels plush, sophisticated, and enormously well controlled. If you’re not in +R mode, that is. As well as fiddling with the engine mapping and sharpening up the throttle, +R mode - which is apparently ‘optimised for the Nurburgring’ - also significantly firms up the dampers. Oh, and it makes the dash go all red for good measure. 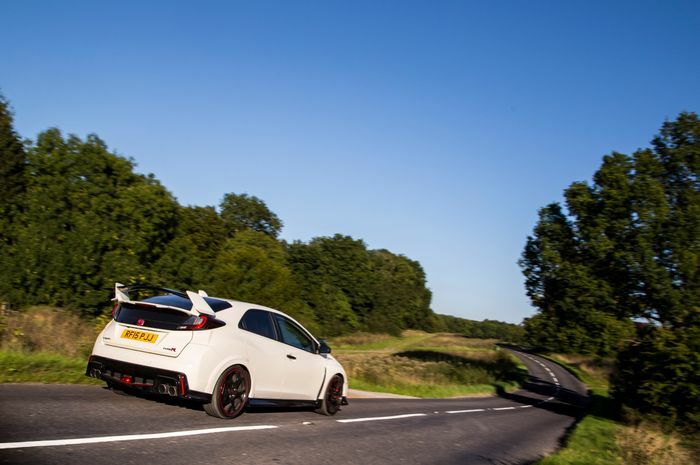 This wasn’t an issue during my previous encounter with the new Type R, which involved lapping Bratislava’s Slovakiaring, and hooning around some smooth-as-glass Austrian back roads. On British roads, you simply wouldn’t be able to cope with +R mode for more than a few minutes. With this shouty mode enabled, the slightest imperfections on the road dramatically crash through the cabin, and the whole car constantly jiggles and fidgets rather unpleasantly at speed. Honestly, most of the time you’re better off not turning it on. The other disappointing thing I’m contending with is the steering: it’s bloody quick and weighty, but rather vague. With the FK2 ticking itself cool, I wandered over to the EP3, and climbed into a much more simple cabin. No Nurburgring optimised sports mode, no fancy shift lights, and definitely no G-meters. It feels rather like a normal Civic actually, and I’m not sure that’s really a good thing. The newer car’s futuristic dash may not be the most intuitive, but it’s a much better starting point, and has many more reminders that you’re in something special. The next issue staring me in the face was the gear lever. It’s sticking out of the dashboard for Pete’s sake, with a ridiculous-looking ribbed gear gater. But, my thoughts of ‘who the hell signed off on that’ were almost immediately banished, as I warmed to the positioning straight away. If feels great to have it a bit higher than in other cars, and if anything, much more natural. It’s no surprise that many competition-spec cars choose a similar place to mount sequential shifters. The shift is a bloody good one too, with a delectably short and mechanically precise throw. It’s a good job it’s such a satisfying change, though, as to get the best out of the low torque 2.0-litre four-banger with its 8000rpm red line and peak power coming in at 7400rpm, you’re constantly shifting up and down the box. There’s no obvious VTEC kicked in, yo moment at the top end (you’ll need to look to Honda engines like the F20C to get a slice of that), although there is a noticeable surge as you seek to headbutt that redline. Sounds pretty good for that last 1000rpm too, in a brutally metallic, almost harsh way. 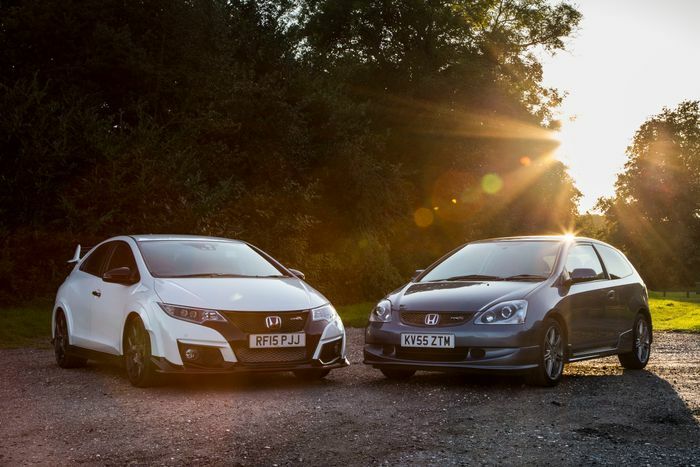 It’s a car that’d take time to get used to and one you need to learn to get the best out of. 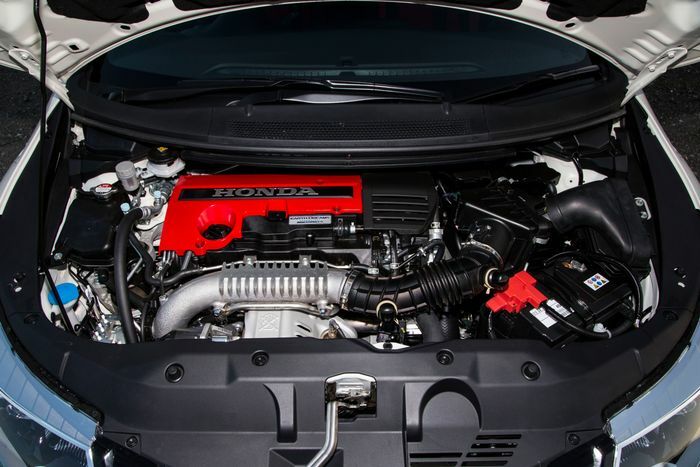 The 2015 machine is a lot more flexible with that muscular mid range, whereas in the EP3 you’re constantly working to keep that N/A engine on the boil. You also need to retune your brain to the later shifts because it feels much more natural to change gear too early. Compared to the FK2 - which is stiff even when you haven’t turned on the spine-murdering +R mode - the EP3 feels very soft, and very prone to rolling. The steering’s a hell of a lot slower too, and similarly vague. I’m having tremendous fun hustling it along, though, and it’s still impressively capable for a 10-year-old car; it’s just something which requires a more delicate touch. Particularly because of the rear end. This is where the driving experience really differs. Apart from under heavy braking - where it can get a little squirrely - the 2015 car’s rearmost boots stay pretty damn secure. 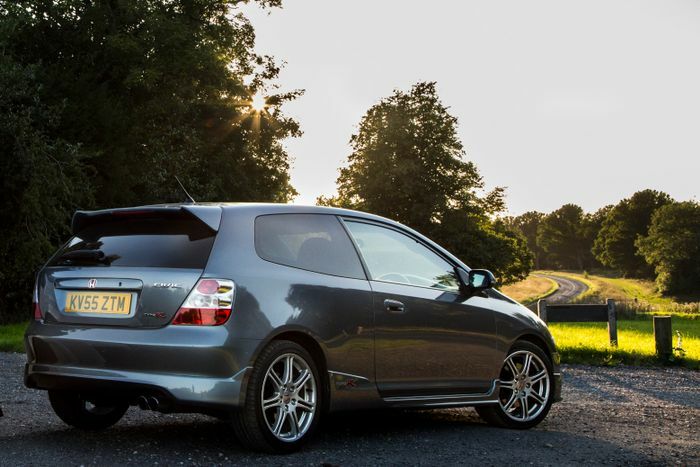 The EP3 on the other hand, is very prone to lift-off oversteer. The back end wants to come forward far more than most front-driving cars I’ve been behind the wheel of, which is un-nerving to start with, but something you start to enjoy once you’re used to it. That loose rear would also be a fun thing to explore on track (we’ll be bringing you our video track verdict soon, in the mean time check out the video above!). It’s unsurprising that the FK2 represents a leap forward from the EP3, but what shocks is just how big the jump is. 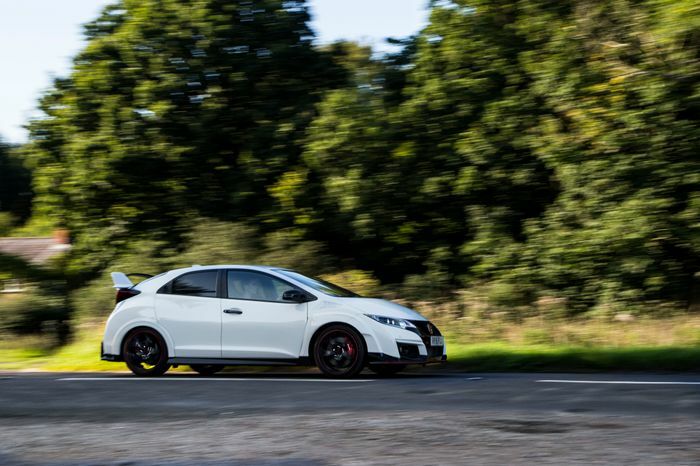 The new Type R feels positively weapons grade to drive. With all the clever tech, the mechanical bits like the diff and the suspension, plus all the aero, it smashes through any road you put before it like a bloody great sledge hammer. It feels more special too; many think the aero bits give the new Type R a particularly ugly aesthetic, and to an extent I agree with that, but there’s something great about pulling up somewhere and having the most bonkers motor in the car park. It’s a feast for the eyes, and when the car was dropped off at my house recently, it looked like a lightly watered down touring car had been deposited on my driveway. It’s the one I wanted to drive the most and after handing both cars back to Honda, I didn’t miss the EP3, but I did pine for more time behind the wheel of the shockingly relentless FK2. But, we mustn’t be too down on the EP3. It was the leftfield hot hatch of its day, and remains unique today with that tremendously revvy N/A four-pot. It requires a more considerate touch than the pretty much foolproof FK2, and that does have its own appeal. Plus, these cars are bargains on the used market, offering a hell of a lot of car for the sub-£3000 starting prices. Today, though, the new Type R is a hugely impressive beast. 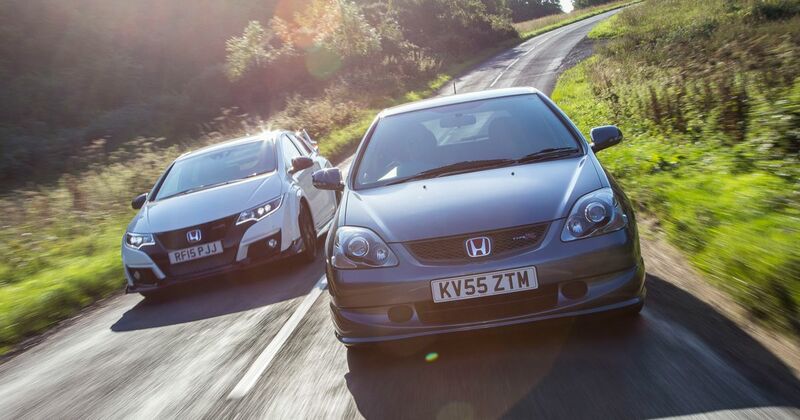 After driving one for the first time, I was pretty sure I’d rather have the Renaultsport Megane or a Seat Leon Cupra, but now, I’m starting to think the lairy Honda is the one to go for. It’s one hell of a return to form. Recommended car throttle shop Worldwide Shipping In The CT Shop Car Throttle Submit Your Videos To Get Featured On Our Social Channels Features Kia Stinger GT 2.0 Review: Should Be The Pick Of The Range...Isn't Features Jaguar XE Review: No 3-Series, But The Gap Is Closing Features Aston Martin DB11 AMR Review: The Imperfect V12 Beauty Features The KTM X-Bow Comp R Makes High Demands, Gives Big Rewards Features Hyundai i30 Fastback N Review: The Best Kind Of Deja Vu Features Bugatti's First Chiron Was A Lamborghini Diablo With A W18 Engine Features FK2 Vs FK8 Honda Civic Type R: How Much Has The Game Moved On? Features Alfa Giulia Veloce Review: More Appealing Than The Quadrifoglio?